Being able to soar through the air still won't save you from recycled oxygen and endless stories from complete strangers. Known as the "Cabin Sparrow," this so-called power lets you fly, but only within the confines of an airplane. At least you can leapfrog the beverage cart when explosive diarrhea strikes at 30,000 feet. The term "explosive diarrhea" makes me laugh every time I hear it. NO, but it might get you to the exit to get off the plane quicker. This is by far the most original and most hilarious blog I've ever visited since don't know for how long. LOL, now that is my kind of super power, I want that one dude! Building an ultralight plane could enable you to fly under your own power. 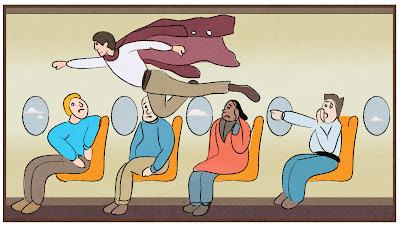 What if you register yourself as an aircraft? This reminds me of an unsuper power one of my teacher's sons thought up once: To be able to fly only as fast as you can walk. It could be useful when you try to stop hijackers. "Building an ultralight plane could enable you to fly under your own power. What if you register yourself as an aircraft?"